Sometimes hooks bend when you're pulling them out of the jaw of a large fish with pliers. Bluefish love to clamp down on them. They are all things good. Aggressive, powerful, fast, aerial, hearty and seriously PO's that you hooked them. Hopefully they will reappear in numbers this season. I disagree with Hook I that bluefish eat anything and everything you throw at them. I have seen them be super selective especially is calm conditions.. 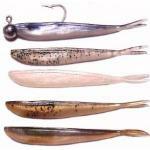 True, or when they're keyed in on large bait but not full-out blitzing, or after dark. I had a buddy follow a bluefish blitz on large bunker in his kayak for 4 hours. He threw everything he had at them, no takers. It happened way to frequently to be hook removal method (6 hooks all 6/0 bent in 21 fishing trips). One bent out on a huge fish at an inlet (not Canal) when I was fishing with 30lb tippet. I really put the screws to fish and fights never last long. Also after switching hooks mid season I have not had a single hook bend on me the line will snap first. If your tippet is less than 20lbs the Gama SL12 are fine. If you are fishing heavy fly gear 10-12 WT with 25-40lb tippet they wont cut it from shore when you cant chase fish and must fight very aggresively. In a boat the Gama hooks are probably fine as you can chase a fish and fight more conservatively. Ian Devlin's flies I bought are on the 10/0 SL12s will be fishing them hard this year see how they hold up. The 10/0 hook wire is noticeably thicker than the 6/0 hooks so I am hopeful no issues will arrise. Yes. The Gamakatsu SL12 hooks had numerous bending issues I no longer use them and instead use Owner Aki or Mustad Signature Tarpon hooks. I landed the fish and released it. Did not notice the hook was bent until the sun came up, but also got no other hits so did not lose any fish over the hook failure. 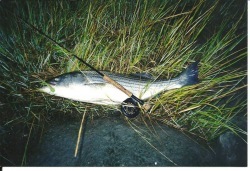 The fish was 34" long so not even a big fish and I was fishing in a saltmarsh with limited current. I was using 20lb test leader and the hook failed well before the leader, not a good sign. That is very surprising. It's amazing how strong 20lb leader really is when it isn't abraded. Speaking of that, is that why you prefer 40lb straight leader when fishing at night around the canal? Are you actually breaking it from outright force or is abrasion a part of the equation as well? Abrasion will significantly weaken the leader. As for the hooks bending, it's a give and take game to figure out how much drag to use. 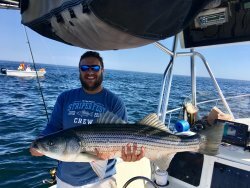 Too much and something may give (line, leader, hook, reel, rod), too little and you wear the fish out more with a longer fight, increasing the chances of mortality. Blues can get super finicky. In that book "BLUES" he talks about how sensitive they are to changes in barometric pressure. This definitely has something to do with it. I think this is why when we get the right atmosphere, they blitz like crazy. So far when the 40lb has broken its been a mistake on my part. I know how the structure lays out and I know when I hook a good fish exactly which way I need to pressure the fish to get it out into the safer water. Two times I have screwed up and the fish has abraded the leader along the structure. I have not hooked any fish at the canal on fly gear yet that is heavy enough to break a 40lb leader that is not abraded. 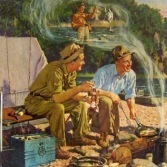 My preference for a leader is the heaviest leader that I think I can use without snapping my fly rod. I also like my leader to be 5lbs lower break strength that the listed core strength of the fly line. So on my 9wt I use 20lb leader, my 10wt I use 25lb leader, on my 12wt I use 40lb leader. My twelve weight I am using a blue water fly line with a 70lb core and 80lb braid for backing that is why I can jump up to 40lb leader. The 10wt the fly line core is only 30lbs so I use 25lb leader. I like the cold water line with the lower strength core's performance better than the tropical blue water line and for most conditions a 25lb leader is fine. I am using the 12wt and heavier set up at inlets that get 3kts of current or higher. Everyone only thinks about the Canal, but I have found some very small structures that create an extreme current in small areas around 3-4kts similar to canal speeds. These areas have been very productive for big fish and I decided in 2019 I will use the Canal fly rod there because I lost some big fish there last year on the 10wt setup. If an inlet is less than 3kts peak current I will go with the 10wt gear. 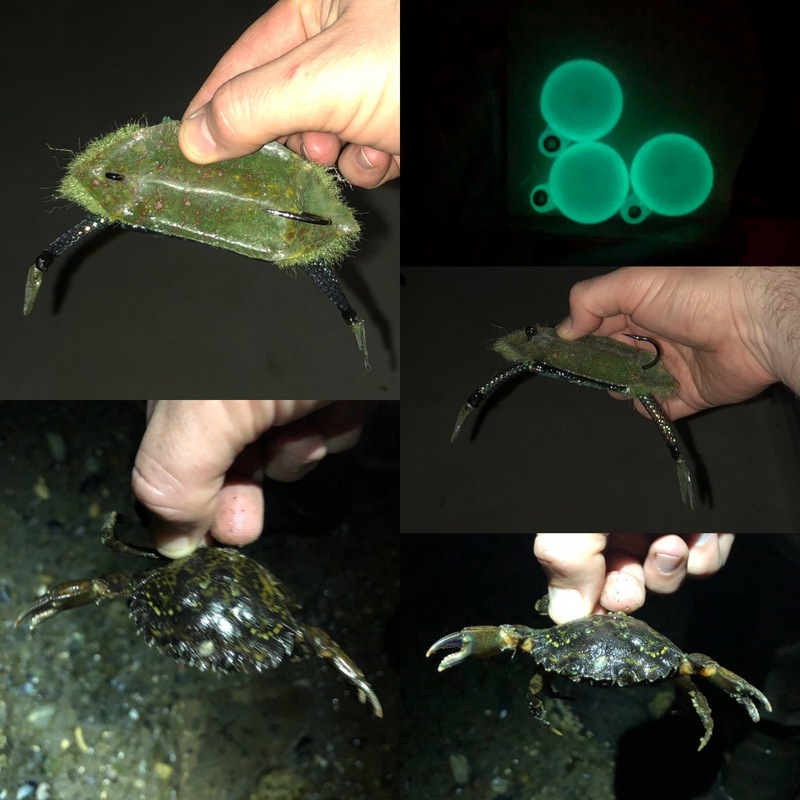 Quick tip: I have mentioned indicator fishing crabs in current flows at night. Dont use your white light on head lamp. 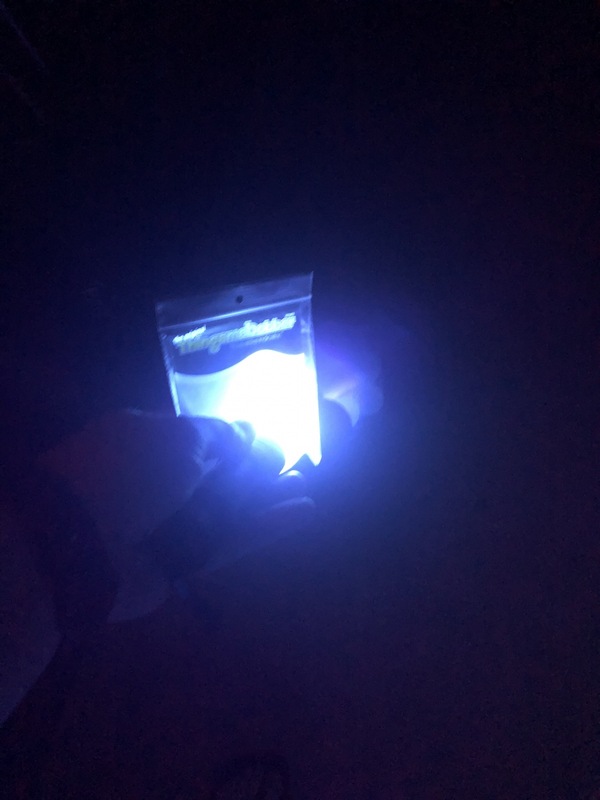 Bring a cheap UV flashlight. It will preserve your night vision much better, not give your position away if you cupp your hands around indicator, and it charges the glow in mere seconds. 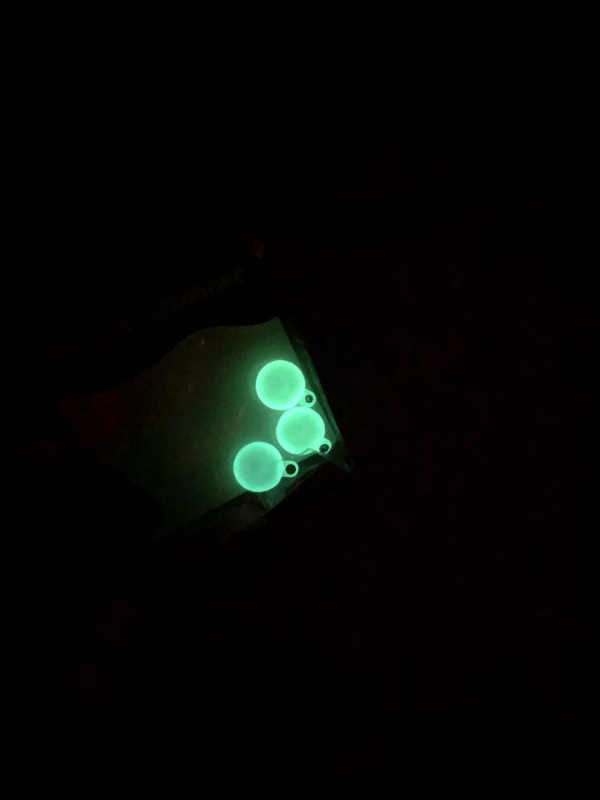 Picture is hitting pack of glow in dark thingamabobbers point blank with $10 UV flashlight from amazon for 6 seconds. The second picture is the nice glow of indicators. Are you dead drifting live crabs or crab flies? green crab flies at inlets to salt ponds or estuaries. Large crab flies 4" wide with two claw arms no other legs. Key is a bigger profile than daytime 3" wide would be fine just not the quarter sized ones you would throw daytime. 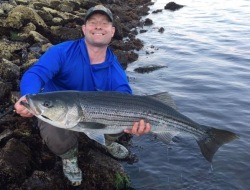 Striper are keyed in on them during molting periods around moons late June through early August. The big females are active at night only. My Dad thought that was a riot. I didn’t get the inconsistency until years later. I spent hours and hours reading that book. I was maybe 12 years old when my parents gave it to me for Christmas. @RedGreen and @bonefishdick this is the large crab fly that I designed last year for night fly fishing. Last years fly was heavily weighted and I was using to tight line nymph and when the drift lane was too far out to tight line I would switch to fishing under an indicator. What I figured out was a heavily weighted 7-8 inch lobster fly seemed to fish much better as a tight line nymphing option not really sure why maybe it was location specific. 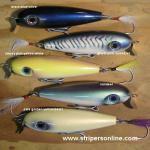 Or maybe its the lobster flies design is better for tight line approach. I found the weight crab flies worked best under the indicator, but I had a lot of snags even with weed guards. Also, I noticed that because current speed is always changing throughout the tide a weighted fly alone cannot be adjusted well to keep the drift working correctly. 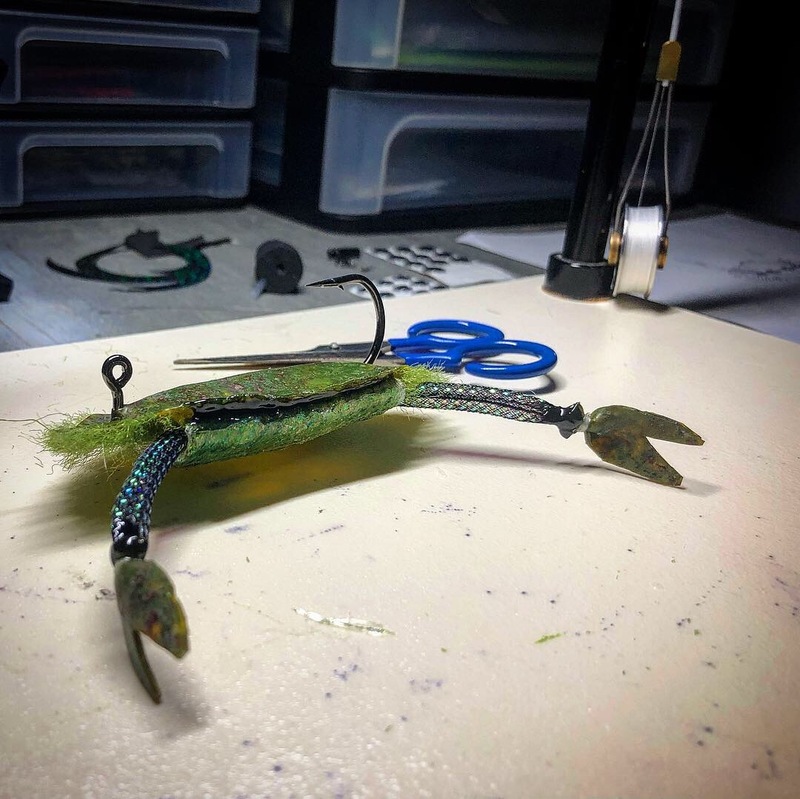 I ran out of season but my conclusion was I wanted an unweighted fly with neutral buoyancy that would tumble and have a soft feel with a lot of body volume like a large molting female crab that gets dislodged. The indicator rig is very simple I use 12 feet of 30lb fluorocarbon with a double surgeon loop on each end. I loop one end to the fly line loop then I tie a clinch knot to the bottom loop like its a hook eye using a 20lb tippet. I like a 2" wide loop the knots on both ends of the loop keep my split shot from sliding up or down the leader. 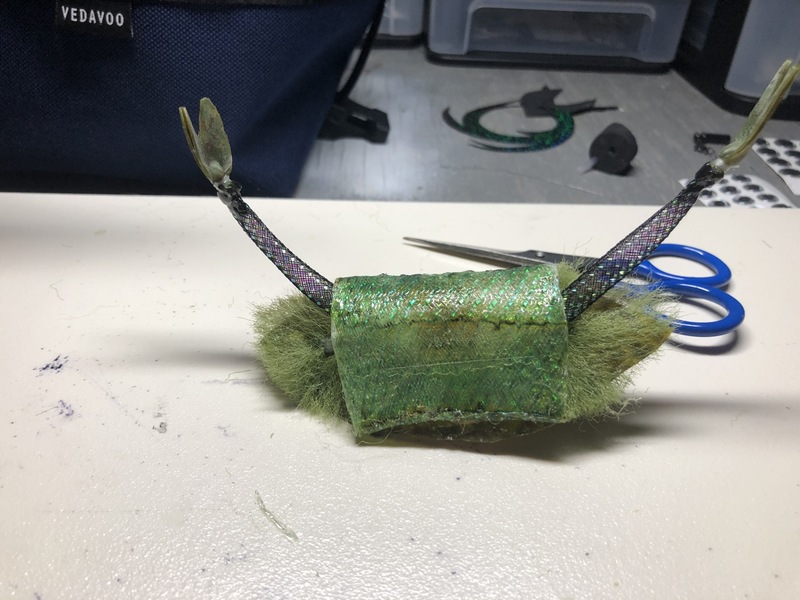 I make the tippet about 2 feet long and tie the fly on with a non-slip loop knot. These crabs don't get dislodged except in the heaviest current so the bite window is best at peak current. When they are molting they are weaker so can be dislodged easier. I was catching crabs and throwing them in the ripping water with a headlamp on to see what position they took when adrift. They tucked their legs in tight to shell body and had their two main claws out in a pinching position as they tumbled. So this fly is designed to present that profile. 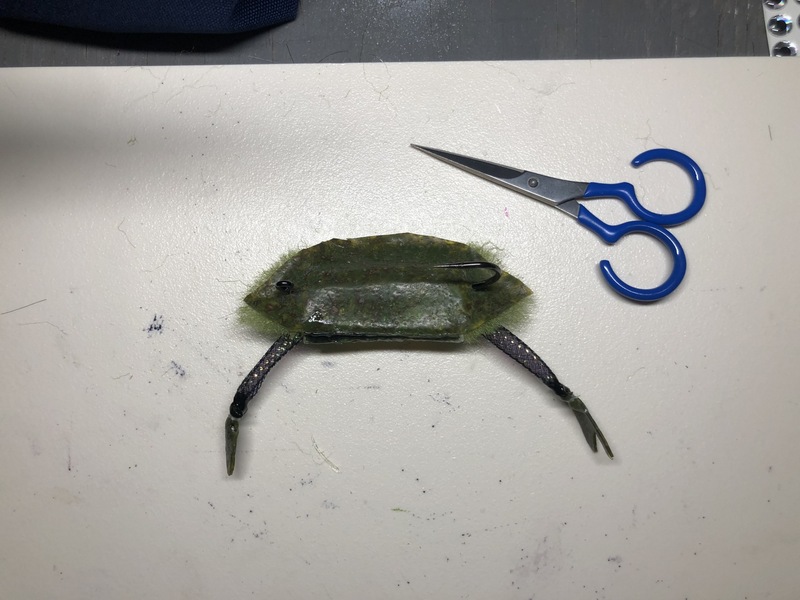 I also build the shell so it forms pockets between the EP fibers and mesh so I can add Pro-cure Super Gel in "Shedder Crab" or "Blue Crab". The pocket design helps maximize gel retention during fishing. I found that an unscented fly caught plenty of fish, but when I added the super gel scent the catch rate became red hot. I was getting fish every other cast. I switched back to an unscented crab and I did keep hooking up but the frequency of bites dropped off substantially. 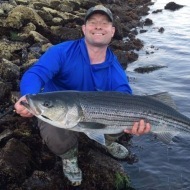 I think the main reason is the scent trail precedes the fly down current and helps the stripers find it in the dark. If the crab flies crosses a stripers path they are going to take it scent or no scent, but the scent helps them track the fly along the bottom of the rocky inlet in the pitch black darkness. On to the fly I upgraded from the 4/0 hooks last year to a 7/0 Owner Jig Hook. The fly is unweighted and is designed to be fished under an indicator with heavy split shot keeping it near bottom. 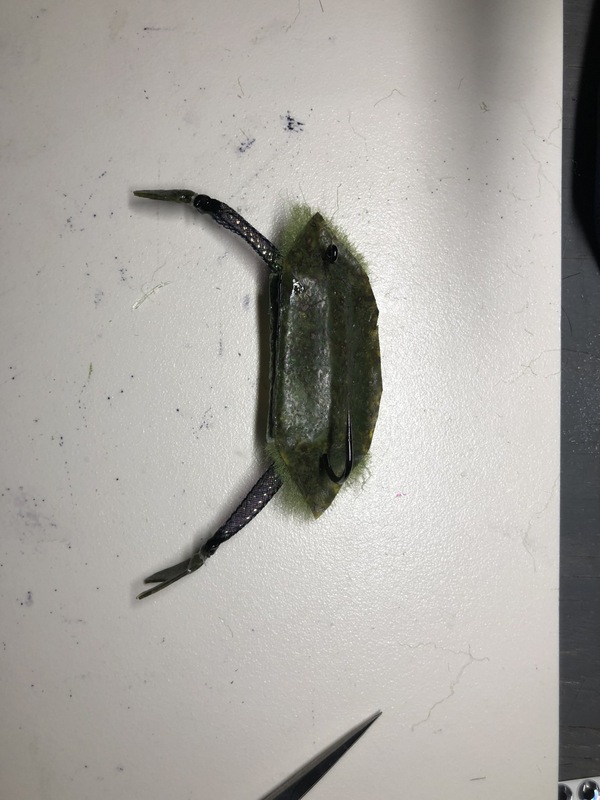 If you wanted it to fish along the bottom on a more normal crab presentation you add dumbell weights to center of shank inside main shell body tubing. If designing to check nymph I would use three dumbells and a mono weed guard as well. I depicted dumbell placement on the sketch. Sketch of fly construction that I drew last year. This is how I tie in the EP fibers to create the other shell profile. I tie in a 2.5 inch long large "peacock" colored section of EZ body tubing at an angle this is the first claw arm. I then tie in 1" EZ body pearl tubing at little further up hook shank so I can fold over to make the pocket area. Then I tie off and anchor all thread wraps with tuffleye core to hold it together durably. I then will push tubing way back on hook. I will eyeball the sizing of tubing as I refine this patter I can give you a specific lenght but for now if you attemp you will have to use your best judgement. I tie the other end of tubing down one 1/2 inch awa from the other tie point. 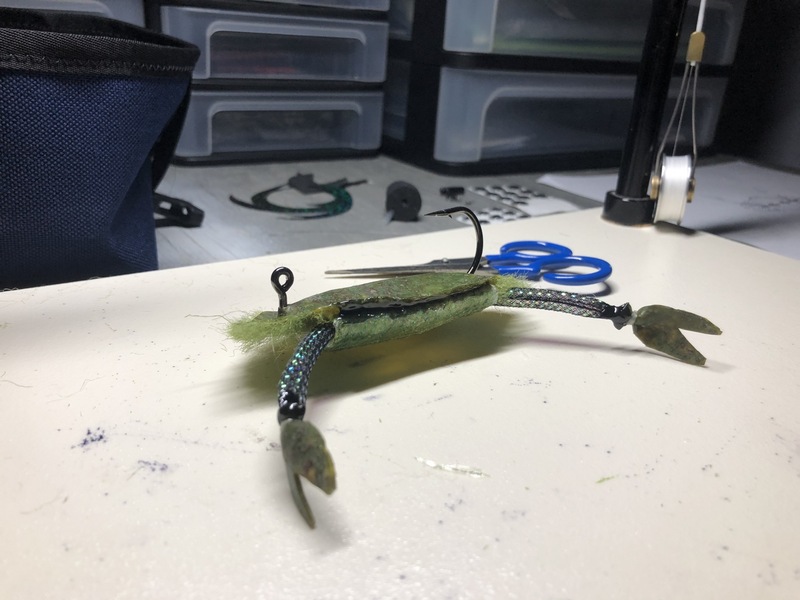 This leaves room in middle of hook shank so if you wanted this to be weighted you would tie your dumbell eyes in on hook in that location before adding the 1" tubing to the fly. Now tie in another 2.5 inch long peacock size large EZ body claw arm. Got to front of hook and work your way back stacking the EP fibers as shown. Once all EP fibers are tied in and flared tie off with several half hitches and then seal all thread wraps with tuffleye core. At this point, the bulk of tying is done. You now have your base for the adhesive work and adding the shell back. You will finish the claws of the fly last. Coat braided material in olive copic marker then useing a wooden coffee stirrer apply E6500 clear adhesive and work it into the mesh body. I like to do first half holding as shown below then I put fly back in vise to finish other half while first half cures. Picture of all materiasl used: Olive EP Fibers, Olive Brown Kiley's Exo Skin, 1" pearl EZ Body mega braid, size large peacock color EZ Body braid, E6500 clear adhesive. Tubing is fully coated and tacky so can be handled but not fully dry. Cut out the shell back from Exoskin. line up shell placement then penetrate with hook point and pull into postition to secure rear end of hook shell. Then eyeball where the hook eye should come through then go 1/8" back from where you think you should put the cut and cut there. Now you stretch the exoskin forward and pop hook eye through. This makes a nice tight connection for shell along hook forming the main structure of shell's back. At this point, you need to let the coating fully cure and let the fly sit for an hour. After its cured, you will add more E6500 under exoskin to adhere it to the mesh. The adhesive dries slowly and this is not a fast process from here on out. I am will post remain steps later tonight. I am going to make a second one in all black color for fishing on dark nights and will use this olive color for bright full moon nights. I may also try using tuffleye flex instead of the E6500 because if I can make that work it will speed up production time because its a light cured adhesive. Right now I have to let fly dry for one hour twice during the construction process using the shoe goo adhesive. If I could just hit it with a light and cure it in sections I could cut all that drying time out which is major problem with making this fly right now. I tried using epoxy and UV resin but the hard coating did not work well. You want a body with flex which the E6500 excels at. I am hopping the tuffleye flex will make a good substitute. I am going to tie two flies the way I know works then mess around with tuffleye flex on a third fly so I have two ready to fish flies incase the Flex is a failure. Shell is secured and fibers trimmed. Last step is sho goo shell to trimmed fibers. And make claws. Will post claw sequence later. Do you find the Copic marker system to be permanent or do they wash out / fade after a little use ?